The “True Early 30’s classic cottage with character. Historically captured as the first “BAT CAVE POST OFFICE” now equipped with newly modern amenities, and still possessing the old time feeling of easy, relaxation, and tranquility. You sleep at night with the peacefulness of the flowing river and the 4 foot waterfall right behind the home below the deck. The view is breath taking in all directions. Trout fishing is a lot of fun with a river stocking taking place once a week. Only 100 yards down stream and 1/4 mile upstream you are sure to enjoy the catch of the day, hopefully for all to see. Personal steps that lead to the river are for our guests with the brand new decks on each level. We recommend water shoes for everyone to wear. Come, sit and relax by reading a book or watching all the wildlife here. We invite you to come and relax and enjoy the beauty of the NC Mountains. And enjoy our own LITTLE WATER PARK & Try SKIING on the river in your back yard?? The Bat Cave can be compared to the old "Route 66". It was considered to be the Old Traders Trail in the 1800s' from Asheville to Charlotte & Columbia until the Interstate system was developed with a Horse Exchange & the only drinking spot on the route. We are at the cross roads of 64, 74 & 9. A 2 lane which is a nicely paved road now. You look up to see the mountains all around you. The breeze coming down the gorge is wonderful. Central heat and air in this home, Could be surprised what some others may have ? Has Net Gear sign enhancer to boost signal Fiber Optic. New remodeled kitchen, Granite counter tops, Glass top Jenn-air island Range/pots & pans Blender,Mr coffee,Toaster, Bosh Dishwasher, Mixer, Full SIZE Fridge, Ice & Water in door We have that 16 Quart LARGE COOKING POT !! TV's Livingroom has 1 HD, 46'' South Master Bedroom has 1, North Bedroom has 1, 3rd bedroom middle beside Gameroom has TV for Wii or Gameboy hook ups. We do have some movies available, check at office for details. Raft has been removed ordered by Game Warden ( In the way of Kayakers) Take your ice chest & rod and play in the river. Area can be enjoyed from rear decks that are just 20ft from river for eaiser relaxation but still with the group. ( FOR ALL AGES), Water shoes or Tennis shoes. There is a REAL Bat Cave. If you like hiking, it is approx. 1/2 mile from the cottage. Tours take about 45 min to hike up to the cave. They give a lot of information on nature and animals in the area.2mi. Chimney Rock Park,& 3 Mi. to Lake Lure & play in the RIVER in the Back Yard! Awesome area, fun for all ages. My family and I will definitely return. Very close to the main road, but nice house in a great location and a super river view from the back deck. Beautiful well equipped rustic cabin. Breathtaking views !!! Great location ! Bruce is awesome and very responsive owner . We will return !!!! Beautiful rustic cabin with updates. Very nice cabin with modern updates. Feels like home with all the amenities provided. Three couples had plenty of room to relax and unwind. Great deck with view of the river, and with shopping close by in Bat Cave, Chimney Rock, Lake Lure and Hendersonville. It started to turn cooler with a nice breeze off the river. Just perfect !! Thanks for the great review Owner. Very nice, rustic house. We loved the deck with hot tub and the river below. Very nice house with hot tub on the deck overlooking the river. (Look up Chimney Rock Park 2 Miles) from the property where shopping, mini golf or going up to Chimney Rock can be a full days adventure. Or Just sit back & Enjoy our on little WATER PARK in your own back yard. Shopping can also be enjoyed in Chimney Rock Hendersonville only 12 miles, or Asheville 22 miles (Biltmore House) as well as in Black Mountain 18 miles. The Asheville Airport is approx 19 miles from us. This area is great for Motorcycles, and group tours are available (ask for more details). It's a great place to get away and just relax, or if you want to go and do things, you are just moments away. As the Site says you book directly with me the Owner, If I LET THEM VRBO, book my rentals you would see a convenience fee the charge is 5-10% added to my rates? You can see I have been a member since 2008 ! 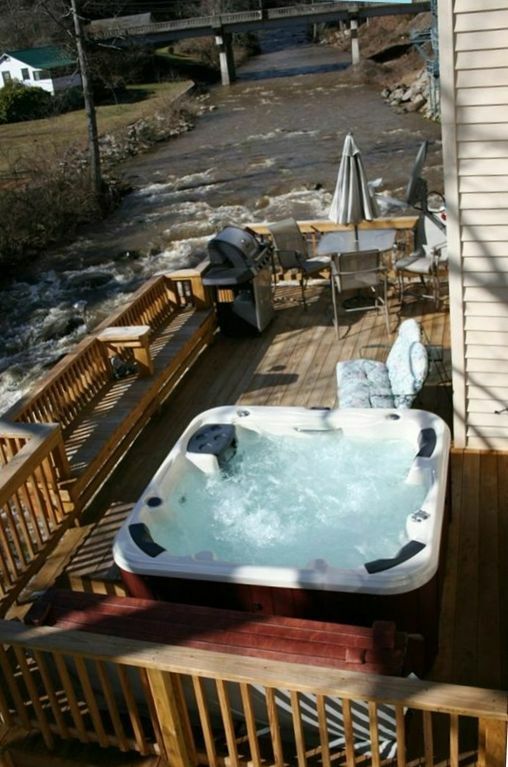 We have a 1,2 & 3Br shown on this VRBO All have Hot Tubs & on the river, site if we can assist you just let us Know.